StraightLineHDD has introduced its newest reamer, the Crusher. Designed to excel in consolidated formations, the Crusher fills a critical tooling gap when an aggressive tool is needed to take on tough rock conditions, but in a diameter that’s typically too small for a hole opener. With a solid body foundation, the Crusher can be configured with either short-bodied radius top carbide buttons for hard rock up to 25,000 PSI or chisel-top carbide buttons for softer formations. The carbide buttons are precisely located on independent cutting paths to insure maximum contact within the hole. 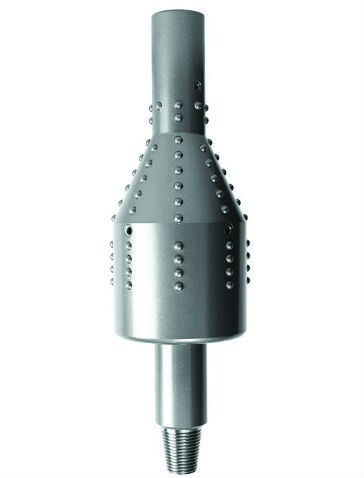 Replaceable fluid ports deliver drilling fluids exactly where needed to insure smooth and efficient cutting action. The Crusher’s tapered solid-body transitions into full diameter in the back of the tool. The full diameter at the rear promotes tool stabilization in the hole and promotes good cuttings control. A one-piece body and shaft design provides maximum strength and extended service life. Its aggressive design thrives in harsh conditions, such as hardpan, cobble and solid rock. Available in diameters from 4- to 10-inches, the Crusher is the ideal solution for small diameter bores in tough soil conditions.